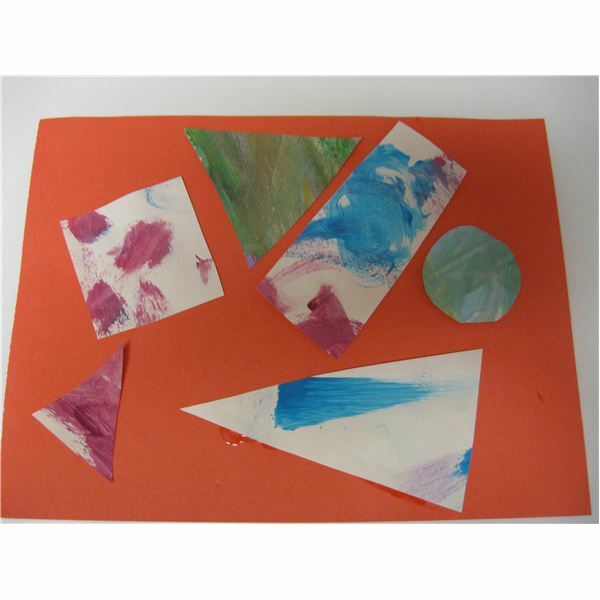 Cut various shapes out of colored paper, wrapping paper or even some of your toddler’s old paintings. 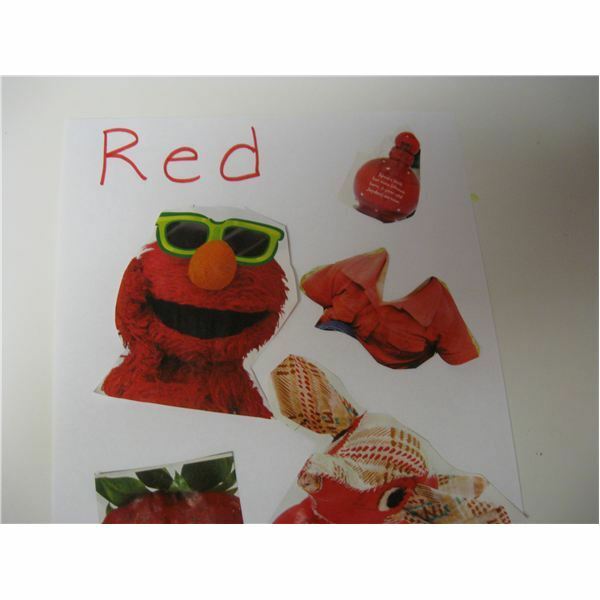 Then let him glue them onto a new sheet of paper to make a new picture. Talk about the names of the shapes as he or glues. Have a shape scavenger hunt. Challenge your toddler to look for shapes around the house, at the park or anywhere else you might be. A great game to play when you are waiting in line at the post office or waiting for the bill at a restaurant! Play this game with colors, too. Make a color collage out of pictures you find in old magazines. Do one for each color and then bind them together into your own color book. Make three piles of shaving cream and then add red, yellow, or blue food coloring to each pile. Let your toddler begin mixing the colors to see how to make orange, green, and purple. This is a fun activity to do after reading Mouse Paint. This very simple book is a great introduction to shapes. On facing pages it shows a shape, such as “circle” and then a picture using that shape, such as “the tractor wheels are circles.” The pictures are bright and colorful and very simply drawn and will appeal to toddlers. This is a perfect first book about shapes. Here is another shape book with simple text and bright, bold pictures. This book invites the reader to find the shapes on each page beginning with finding “the bear in the square” and ending with “the stars in the dark.” Although there are no numbers in the book, the shapes on each page increase from one to ten so it makes a great counting book, too. This picture book introduces the common beginning shapes, like circles and triangles, as well as some that will probably be new to your toddler, like crescents and spirals. It tells the name of the shape and underneath it shows how that shape can be turned into a sea animal e.g. a crescent turns into a dolphin. On the facing page a sea scene with the new shape animal is pictured. This book is a good choice after your toddler is familiar with some shapes. She will enjoy looking at the sea scenes and picking out the shapes. Here is another silly book by Sandra Boynton. This book introduces a few colors as a bear, an elephant, a moose, and a turkey put on a different item of clothing on each page. Your toddler will laugh as the animals get dressed and the turkey, “Oops!” always seems to get it wrong. This is a fun book to teach colors but could also be used to talk about different items of clothing and the body parts they go on. This cute story tells about three white mice who jump into some paint cans one day while hiding from the cat. When they come out of hiding they discover that as the paint colors mix ,new colors are formed. What a fun way to teach your toddler about mixing the primary colors to make new ones. Other books by Ellen Stoll Walsh are Mouse Shapes and Mouse Count. This is not only a fun book about colors, It also tells a sweet story of a chameleon learning who he is and accepting it. The chameleon is sad because he doesn’t have his color like the gray elephant and the pink pigs. He changes depending where is and wishes he could stay just one color. Fortunately, he makes a friend and they decide to stay together, so that though their colors will change, they’ll be the same color together. Toddlers will be fascinated by this little color changing chameleon. If you are interested in purchasing any of these shape or color books, they are available on Amazon. This is a series about choosing books to read to your toddler. This series will focus on books that are high quality, age appropriate and high interest to toddlers. The four article will discuss books about letters, counting, shapes and colors, and animals.